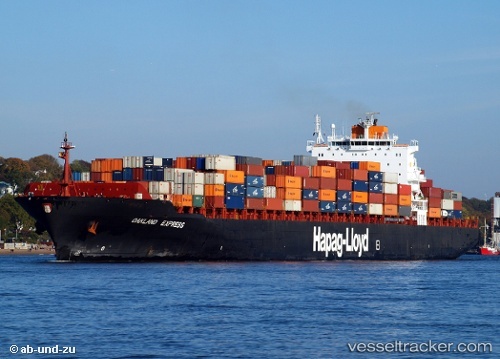 Due to the recent strike action at APM Terminal Rotterdam, Hapag-Lloyd to cancel the Rotterdam call of following PAX vessels: Oakland Express 56E34 / 57W42 Rotterdam import cargo will be discharged at Hamburg CTA for further connection with “Tsingtao Express” 035E42 ets Hamburg October 22, eta Rotterdam October 23, 2013. The drunken master of the container ship "Oakland Express" (GT 54 465) was arrested by the water police in Bremerhaven. Just before sailing to Rotterdam an alcohol test, according to the police led to 2.16 per thousand alcohol in blood. The ship had been proven on Monday evening with a driving ban. After the captain was sobered, the sailing ban was lifted and the ship left early yesterday. The "Oakland Express" was built in 2000 by Hyundai in Korea and is the management of the Greek shipping company Costa Mare. The ship is chartered by Hapag-Lloyd.